For some ideas that really make you rethink the concept of three dimensional reports, we’ve pulled together ideas from some of our T2T contributors. Perfect for book reports and author studies, these are bound to make your students go that extra mile when putting together their information. If you have a great idea you’d like to share, simply drop us an email. 1. Folded a 12 x 18 sheet of newsprint in half long-wise (I call it a hot dog). 2. Open in and fold it in half width-wise (I call it a hamburger). 3. Fold it again while in the hamburger stage. 5. Folded part should be by the students’ stomachs. 6. Cut on the middle fold going only so slightly past the next fold. 7. Open it back to the hot dog. 8. 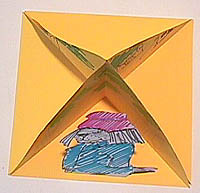 Accordion it to make a folded book. Should have about 7-8 pages to use for a book report project. Sizes vary according the size of the paper use. Quadramas are four trioramas put together. Trioramas are made from 9″ square construction paper. fold diagonally twice. Open. There should be an X fold pattern on the paper. Cut from one corner to the middle on a fold line. Overlap the bottom triangles and glue or staple. Background should be drawn on the top two triangles before gluing. Then decorate like you would make a diorama, scenes from the book. Glue 4 trioramas together in order. It will then stand nicely on the table for display. I did this with my 1-2 class quite well. Older students could do even better. We used them for author studies, making one triorama for each of four books by one author, then they inserted a flag on a stick (like for kabobs) in the center with the author’s name on it. For our trioramas in grad class, we were put into groups of four and we picked out a story book. Each member of the group made a scene in their room from the story. We colored and cut out characters leaving a tab to fold back and we glued these in so the characters and setting were all standing (looked very 3-D). Then we attached each of the rooms – it ended up looking like a pyramid. The student who did this project said his kids loved it and they would hang them from the ceiling or put them on a window sill. Book Jackets from Laura B. The 4th grade teacher in our school does a book jacket book report. She has the kids fold the paper like it’s a hard cover book book jacket. On the ‘cover’ they illustrate a cover for their report (this is usually any picture that they want that will describe the story – not the cover of their book). On the inside flap they write a description of the main character. On the inside back flap they write a description of either the setting or the problem (she switches it every now and again). On the back ‘cover’ they write a summary of their story. 1. You need to create a large (symmetrical) flower with only four petals on the 9×12 sheet. 2. On one petal: Write the title of the book, the author’s name, and your name. 4. On the third petal: Write a brief summary of the book’s plot. 5. On the last petal: Describe the setting of the book. Use words and/or pictures to tell where and when the story took place. 1. Carefully cut out the flower. 2. Using a hole puncher, make a hole in the center of the flower. 3. Choose an object from the book that symbolizes the story. 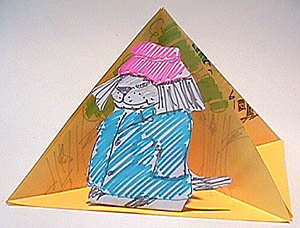 Use colored paper and other craft materials to create a figure to represent that object. The figure must be small enought to fit inside the completed ornament. 4. Tie one end of the string to the top of the figure, thread the other end of the string through the hole. 5. Glue the ends of the four petals together by carefully curing each strip around the center figure and then overlapping the tips. For a quick list of folded paper book report ideas, check out this site from About.com. Don’t miss our related page, More Ideas Than You’ll Ever Use For Book Reports! Humor: Are you a true elementary school teacher?